Put your best foot forward for mental health this weekend. 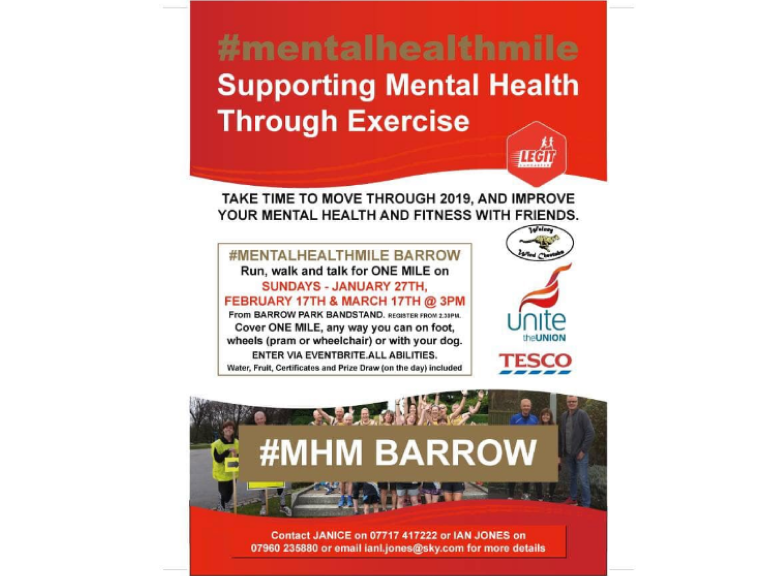 The Mental Health Mile provides everyone with the opportunity to support their own mental health and well- being through exercising alongside a great bunch of friendly people in a beautiful environment. This fun one mile marshalled route through Barrow Park is absolutely perfect for the whole family and dog friendly too. It’s open to all abilities and is a fantastic introduction to exercising, enjoying the great outdoors and mixing and participating with other people. This can be used as an entry level to the very popular Barrow Park Run, or simply as a way to kickstart your journey towards a fitter, healthier you. There is a fee to take part, this is necessary in order to keep this event going. Single entrants can pay a £3 fee on the day of family tickets are £10.There is no charge for children aged 4 or under. With Profits from entry fees (after organisational expenses) will be split between Mind in Furness and Positive Futures North West. Give your mental health and your physical health a boost this weekend and get involved!